We talk to hundreds of Jeep owners each month at Just for Jeeps, and they all have one thing in common: They want quality parts for their customization projects. Some may want extra utility and storage space on the exterior, others may want full rock rails and headlight guards. The projects are different, but the demand for quality is the same. That's why we work directly with Mopar to bring customers the finest parts for their off-road upgrades. Mopar makes most of the parts found in each Jeep on the showroom floor, and drivers swear by the quality of each precision-crafted, quality-tested component. Jeep drivers know that their Jeeps are high-quality because they are made from high-quality Mopar parts. 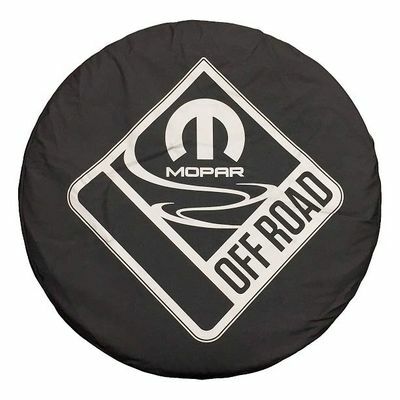 Share your pride over the parts that make your Jeep the off-road beast that it is with our Mopar Off-road Tire Cover. Featuring the Mopar Off Road logo in silver lettering, it's made from black soft-top material for superior spare tire protection, whether it's from the elements or debris. And because it's made by Mopar, it will fit your Wrangler's spare like a glove while matching the look of the rest of your Jeep. ITem # 82214402 - Fits tire sizes 255/75R17 and 255/70R18 tires.